« Winner, winner. Harrah’s chicken out. The summer is nearly here, so we decided to head to the seaside. 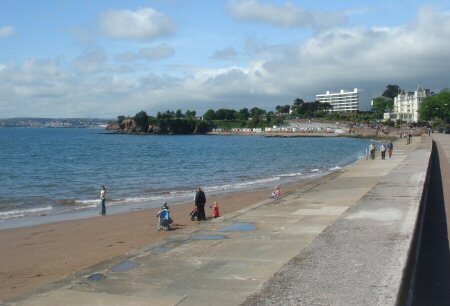 Using a complimentary weekend train ticket, our destination was fabulous Torquay. This trip didn’t actually work out too bad. It’s a 4.5 hour journey each way, with 6 hours there to soak up some rays, go for a swim, or whatever. I’d never pay for that train, but there’s worse ways to use a free train journey than to head for the coast. The only problem: no beach. Nothing to speak of, at least. Plenty of water, but only one tiny strip of sand. Perhaps I should have done more research than just try to name a seaside town, check if the train went there and make sure the station was within walking distance of the coast. Maybe it was just high tide the whole time we were there. There were a few bucket-and-spade shops, which suggeests there’s more to Torquay than water, but I didn’t see it. Maybe it’s just a bit further away than we could venture, but by foot we were stuck with whatever piece of coastline was nearby. Boats. There were lots of boats. Claire asked if I’d ever want a boat, and I said only if the other guy had a flush. Oh how we laughed at the very clever poker joke. I’d seen a pier on the map, but it wasn’t much more than a plank out into the harbour. What a con. At least there were seagulls and the smell of the sea drifting in and out. Not to mention dodgy amusement arcades, where we came across more than one fruit machine pro. Oh my word, how fast they need to press those buttons to do this for a living. Having waited for me to drop two quid into a machine and walk away, one of them jumped straight in there, pumping it as hard as he could in order to squeeze out the five pound jackpot. Plus EV. I think it only cost him £4 more so that’s a pound clear profit for those who are willing to put in the time to learn the system. If you can do that three or four times a day, then… wow. 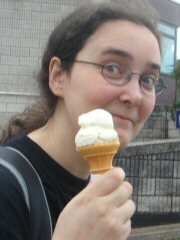 But of course the most important things were clotted cream – which it’s illegal to leave Devon without, and which made me very pleasantly sick after we got home – and ice cream. 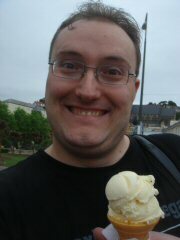 We do like ice cream, as you can see.